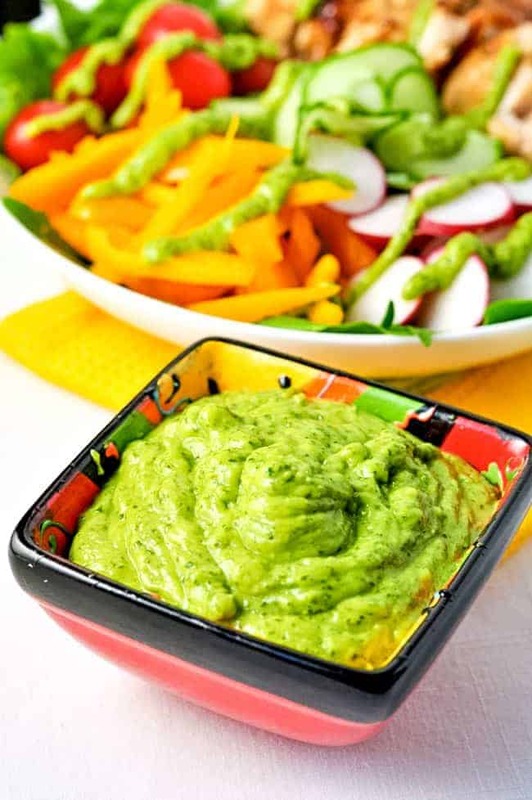 This dairy-free avocado crema is a dip, it’s a dressing, it’s a topping for tacos! Keto, vegan and paleo and Whole30-friendly. 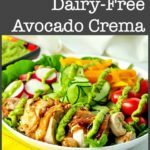 Drizzle this traditional keto dairy-free avocado crema on top of a Classic Spinach Salad, on fish tacos, on a burrito bowl or use it as a sandwich or burger spread. It’s quick and easy to whip up and you can store it in your fridge to use throughout the week. 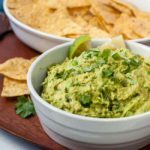 While avocado cream (or avocado crema as it is also known) is often made with Greek yogurt or sour cream, this recipe is dairy-free! You won’t miss the dairy one bit! Last week, Denis and I helped my brother and sister-in-law pack up their home. We’re so excited that they are moving here, just a short drive away from us. While stuffing the contents of kitchen drawers into boxes, our conversation turned to cooking. My sister-in-law remarked that they make my Fresh Burrito Bowl fairly often. I had forgotten about the avocado cream in that recipe. Food blogging has so many benefits, but one of the disadvantages that I know other food bloggers also find is that we rarely make the same thing twice. Meal time is an opportunity to try a new recipe, get out the camera and set up that food shot! 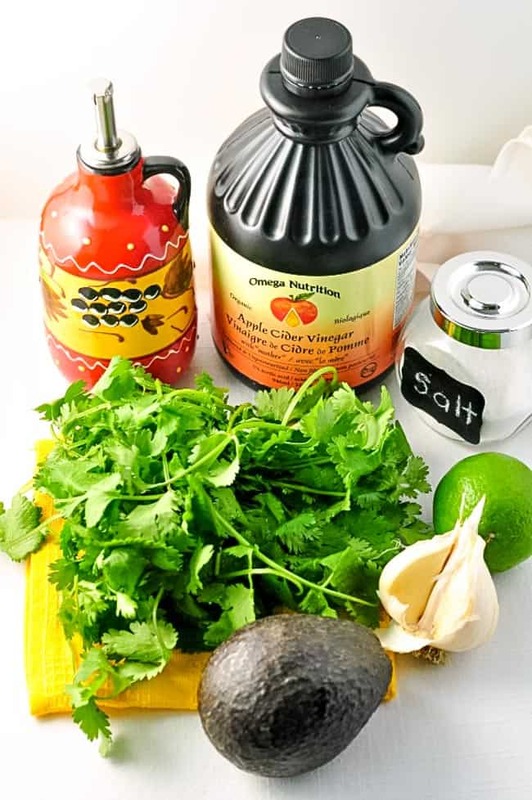 Fresh cilantro, lime, garlic, olive oil, apple cider vinegar, a little salt, and avocado make up this tangy, creamy dressing. Avocado crema is usually made with sour cream or Greek yogurt, but this dairy-free version turns out just as creamy. You just have to try it to believe it! Convinced? lime: you’ll need the juice from one lime. Roll it on the counter to burst the individual segments to help them release their juice or try these other tips to juice a lime. garlic: 2 cloves. Fresh garlic is so much better than powdered garlic in this recipe! 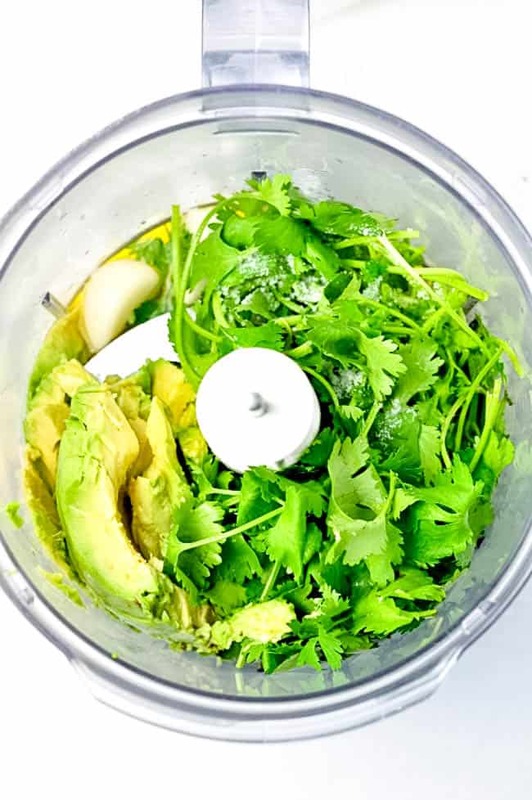 Toss the ingredients in a food processor, whir away until well blended and store covered in the refrigerator. I keep mine in a squeeze bottle so I can aim it where I want it. 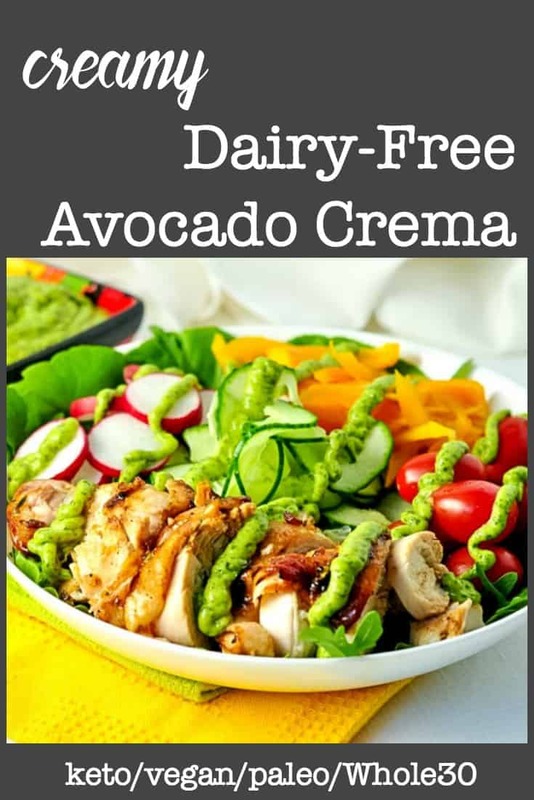 Today I made a simple salad of garden vegetables and grilled chicken and topped it with this creamy dairy-free avocado crema. 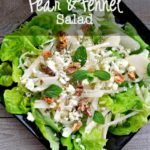 It gave this salad the touch it needed to take it from boring to bright. 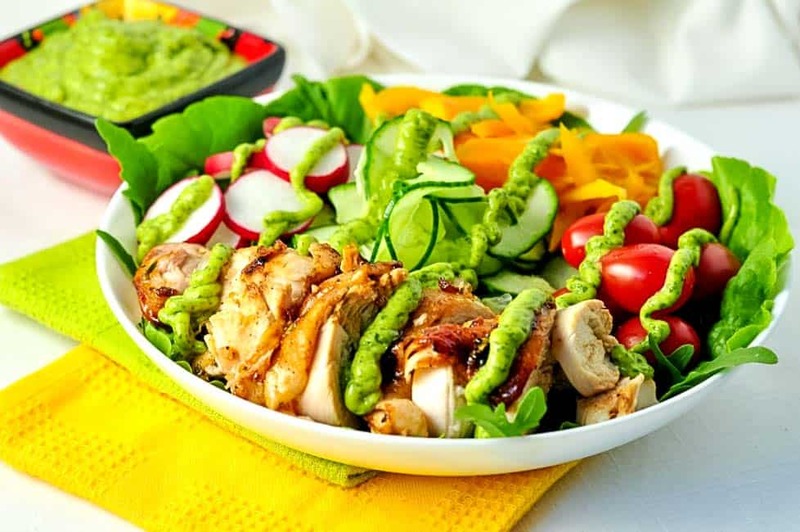 Try it on your favourite salad, on this Classic Spinach Salad with Creamy Avocado Dressing, or with your favourite Tex-Mex meals! 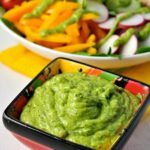 This dairy free avocado crema (or cream) is a dressing, it's a dip, it's a topping for tacos or burgers. 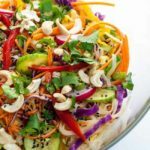 Keto, Vegan, Paleo and Whole30-friendly! Put all ingredients in a food processor and blend until smooth and creamy. This recipe makes 1 1/2 cups of dressing, much more than you would need for a salad. You can easily halve the recipe. Nutrition facts are based on a serving of 2 tablespoons. If you make this recipe for avocado cream, be sure to snap a pic, Instagram it and hashtag it #flavourandsavour. I love seeing what you make! This recipe has been updated with new information and instructions. Thanks Kennedy! I have a love affair with avocados too! I use white balsamic vinegar in place of the white wine vinegar and it’s fabulous…. That’s a great idea! I’m going to try that next time. I love that white balsamic! Thanks for commenting. 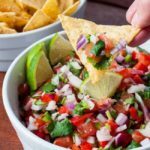 Since discovering this recipe here, I make it all the time!. I don’t miss the dairy one bit! Thank you for this recipe! I needed a dairy free potato topping for Easter dinner and this will be great! In order to keep it thicker I reduced the oil and vinegar. I also added a little white pepper which tasted great. Thank you for helping keep my dairy-sensitive guests happy. Thanks for letting me know how you adapted this recipe. It’s helpful to my other readers too! Happy Easter! I made this for my breakfast burrito this morning…it is delicious! That’s a great idea, Collette! Thanks for letting me (and my readers) know! So glad you like it.